Oatmeal sure is fancy these days — and I love it. Today’s tricked out oatmeal “bowls” are far more interesting than the just-add-water oatmeal packets I remember from early adulthood, before I figured out how to cook. Oatmeal, cooked over the stove, is a great source of fiber. Adding some nuts and seeds provides some protein and healthy fat. I’ve also added some coconut oil for additional flavor and healthy fat — this can help you feel more full throughout the morning. This Pumpkin Spice Oatmeal Bowl with Caramelized Banana and Chia starts with oats that have been soaked overnight. This cuts down on cooking time on busy mornings. In the morning, all you have to do is heat the oats, add spices and flavors, and give the mixture a few minutes on the stove to help the flavors meld together. Caramelized banana is what makes this particular bowl so special — and you don’t even need butter or sugar! Just spray a little coconut oil or cooking spray onto a non-stick pan, and your bananas will caramelize just fine. This recipe gets an extra nutrition boost from turmeric and unsweetened pumpkin puree — both of which are great anti-inflammatory foods. Turmeric has been shown to improve brain and cardiovascular function, and is also helpful for those dealing with arthritis and joint pain. Pumpkin, and other winter squash, have a unique combination of antioxidant and anti-inflammatory compounds that are being researched for their potential effect on cancer prevention, and specifically, prostate cancer. Pumpkin is also helpful for stabilizing blood sugar. I’ve recommended some toppings here, but you can of course use whatever you have on hand. 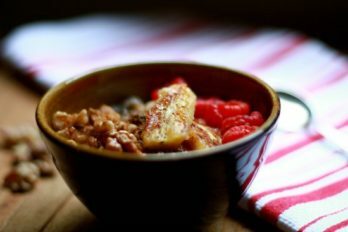 I often like to add some fresh berries alongside the caramelized banana for a little pop of color, and bright flavors… and antioxidants, of course! 1 cup steel-cut oats (you can also use rolled oats for a softer texture). * Prep Ahead: cover with water and soak overnight. Place the oats in a glass bowl and cover with water. Soak overnight on the counter. In the morning, drain the oats. Then, put them in a medium sized pot over medium heat, with the hemp milk, pumpkin puree, cinnamon, pumpkin pie spice, turmeric, and sea salt. Give everything a stir and let it cook for a couple of minutes. Add water if things get a little too thick. While the oats are cooking, set up your banana — spray some cooking oil onto a non-stick pan and heat it over medium heat. Once the pan is hot, add the banana pieces, flat side down. Sear the banana for a couple of minutes before checking for doneness. When the flat side is caramelized and golden brown, carefully flip the pieces with a spatula. When both sides are golden brown, remove from heat and set aside. Back to the oats... continue to stir occasionally, adding water if you want a more porridge-like consistency. The mixture should cook between 5-10 minutes. Remove the oats from heat. Stir in the flax seed and coconut oil. Stir until the coconut oil is melted. Remove the oats from heat and spoon into bowls. Arrange a piece of caramelized banana on top of each bowl, then garnish with chia seeds and walnuts. Drizzle some maple syrup over the top. Serve alongside additional hemp milk, if desired. 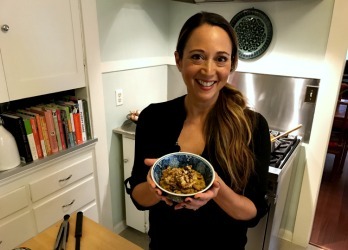 This recipe was featured on the More Good Day Oregon show. For additional More GDO recipes, please click here.